Last year the Mariners added Robinson Cano, a 6.4 WAR player, to their lineup. They got a very good performance from Kyle Seager. Dustin Ackley made it seem as though he’d found himself before succumbing to bone spurs. But they only managed to score 10 more runs than they did in 2013. They improved their pitching and defense, greatly aiding their run prevention and allowing 80 fewer runs than they scored. But in the end, the team simply lacked offense when they needed it. One area the Mariners must improve if they expect to make the playoffs is at designated hitter. Mariners at that position were a combined -2.1 WAR. What does that mean? It means if we’re playing fantasy baseball, and the M’s have a league average DH, the M’s are in the playoffs. 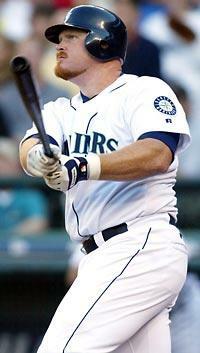 Bucky Jacobsen was a seen as a replacement for Edgar Martinez until injury derailed his career. Since Edgar Martinez’s retirement in 2004, the Mariners have trotted out a ridiculous number of bad DH’s. By bad, I mean DH’s who were below league average. In 2005 contributions from Raul Ibanez’s 2.0 WAR cancels out -1.3 WAR from Greg Dobbs and Scott Spezio. But Ibanez got 62 games worth of at bats in the outfield, so call it a wash. In 2009 Mike Sweeney, Ken Griffey, Jr. and Chris Shelton were league average. 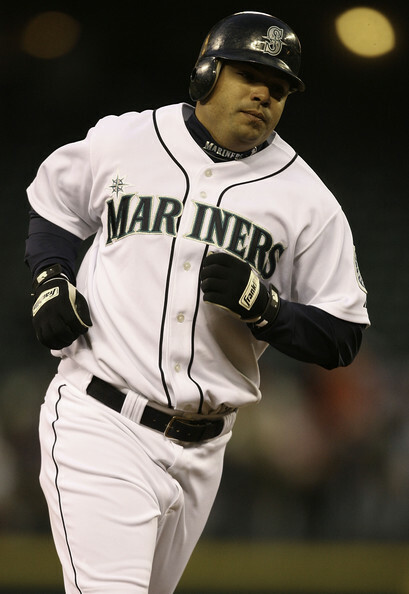 Jose Vidro had a great year for the M’s in 2007, but imploded in 2008. Six of eleven seasons in which a position created to generate offense could not meet league average. In some years it was truly terrible. In order to make the playoffs the Mariners must upgrade their DH. A slumping, frustrated Ken Griffey, Jr. was done in 2010 after a league average 2009. They rotate the at bats to give guys days off from the field. Most AL teams do this. It gets a bit more complicated for the Mariners because they keep an eight man bullpen and 13 man pitching staff. I don’t see that changing much under manager Lloyd McClendon. He was highly effective in manipulating the bullpen that contributed so significantly to the team’s success. But, that doesn’t leave much of a bench to work with for rotation, and let’s face it, the M’s bench situation has been thin for years. 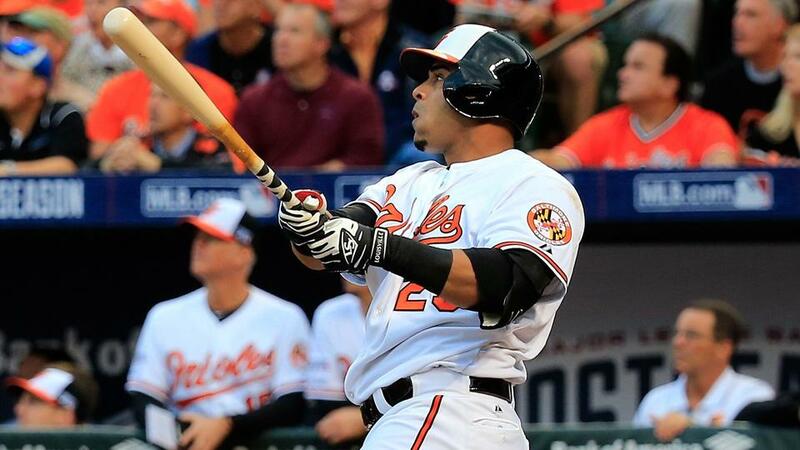 Nelson Cruz hit 40 home runs for Baltimore in 2014. He wants a four year deal that would likely cost $65-70 million. At age 34 he’s a prime candidate for regression. Because the Orioles made him a qualifying offer, if the Mariners signed him they’d have to fork over their first round draft choice. Cruz is a year removed from his PED suspension in the Biogenesis scandal. He strikes out a lot and doesn’t walk much. Cruz is right handed, his power is to all fields, and the ESPN Home Run Tracker shows his bombs had enough muscle to get out of Safeco Field. Torii Hunter is looking for a job. From ages 23-33 he was one of the most breathtakingly brilliant outfielders in the game. At age 39 he will be ripe for assignment as a DH. Though he could probably fill in the outfield for a few games, but he was epically bad for the Tigers last year with a UZR 150 of -20.1. His bat, however, has remained productive with a .286/.319/.446 slash line in 2014. Hunter is a free agent; his 2014 salary was $14 million. He probably could be signed to a one year deal. The Arizona Diamondbacks just signed Cuban player Yasmany Tomas, making the services of Mark Trumbo questionable if not unnecessary. Trumbo is right-handed, and at age 28 offers some serious right handed thump. He is an all or nothing guy-30 home runs, but a sub .300 OBP with buckets of strike outs. He has played 1B, 3B and the outfield with the Angels and Diamondbacks, but clearly his best defensive position is DH. Trumbo is arbitration eligible and doesn’t become a free agent until 2017. The Mariners would have to give something up to get him. Certainly there are other players out there who could fill the DH role, but likely they would require a trade. 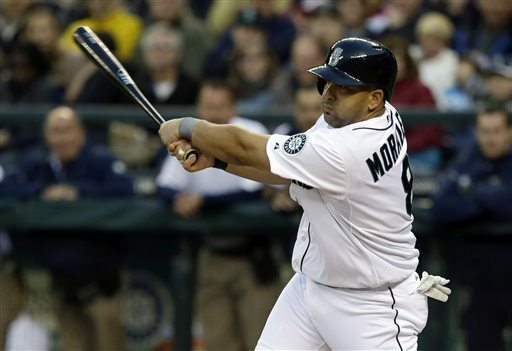 While it is unlikely the Mariners will be able to find a player with the consistent brilliance of Edgar Martinez, surely they can find a guy or guys who can reach the heights of Kendrys Morales in 2013 or Jose Vidro at the end of his career in 2007. The M’s don’t need a Hall of Famer, but they can’t be horrible either. The heat has officially been turned up under the Hot Stove League. Detroit re-signed the best hitter on the free market, Victor Martinez, forcing the Mariners to look at other possibilities. The M’s also have to make some decisions about whether to trade some of their major-league-ready starting pitching and how to go about adding some organizational depth to their pitching staff. We’ve already seen a flurry of activity this week as the M’s made some minor league moves, adding infielder Ketel Marte, catcher John Hicks and right-handed pitcher Mayckol Guaipe to the 40-man roster, largely as protection from the Rule 5 draft. They also traded career minor leaguer Ty Kelly to the Cardinals for right handed starting pitcher Edgar Olmos. Olmos is likely organizational depth as the Mariners sort out their pitching needs for the coming season. One thing is clear as the good ship Mariner scrapes it’s bottom, paints over the rust, prepares the good ship Mariner for its 2015 cruise-the team is good. It’s close to competing for a playoff spot, if not a division crown. But, the situation will continue to be hopeless if the team cannot score more runs. There are lots of rumors swirling around the team as they continue their annual off-season search for offense, particularly of the right-handed power variety. It seems they are looking for it in any number of ways-at designated hitter, in the outfield and possibly at shortstop. The Mariners are linked to any number of rumors, free agents and trading partners. As yet, nothing has happened. The first of these rumors is that Michael Saunders would be intensively shopped during the General Managers meetings Nov. 10-13. Saunders is still with the team, and he has changed his representation. Whether this means the foot-in-mouth disease that seemed to afflict Saunders’ agent Michael McCann and Mariners GM Jack Zdurencik is cured, and all is nice once again. I don’t know if this change may smooth some of the disconnection between the two parties, or if Saunders’ standing is irreversibly damaged. Could Nelson Cruz be the Mariners next DH? With right-handed DH’s Victor Martinez and Billy Butler signed to the Detroit Tigers and Oakland A’s respectively, the Mariners are linked to Nelson Cruz, he of the Baltimore Orioles and 40 2014 home runs. A free agent, Cruz is looking for a four year deal. With all his power, Cruz is not without question marks. At age 34, a history of PED use, and of limited utility as a defensive player, is Nelson Cruz the right guy for the Mariners DH? It likely depends on the deal, but it’s clear Cruz offers a significant upgrade at DH. Another right-handed batting free agent linked to the Mariners is shortstop Hanley Ramirez. Over a ten year career, Ramirez has made a career as a very good right handed hitter with a .300/.373/.500 slash line and a 132 OPS+. But, Ramirez also carries some baggage. He struggles with injuries. He has attitude. Most importantly, Ramirez is below average defensively at one of the most important positions in baseball. In 2014 his UZR 150 rating was -15.6 runs saved above average, and continues a career history of ratings at or below average. There is talk that Ramirez might move to a corner outfield spot or slide over to third base. However, it’s not clear how this helps your Seattle Mariners or whether the prickly Mr. Ramirez would even agree to such a deal. There is also the small matter of two young Seattle players, Brad Miller and Chris Taylor. Neither are fully developed and offer cost-controlled, superior defense at shortstop. The M’s are also linked to important trades. One is with the Atlanta Braves for Justin Upton. The Braves already traded outfield mate Justin Heyward to the Cardinals for pitcher Shelby Miller. The Braves said their star left fielder, with one year left on his contract, is available, but will require more to pry him loose they got for Heyward. Upton hit .270/.342/.491 with 29 home runs for the run-challenged Braves last year. He strikes out a lot, and averages out as a slightly below average defender. Taijuan Walker is mentioned in trade rumors for Upton. Should the Mariners trade a young, highly touted pitching prospect for one year of Upton? David Schoenfeld at ESPN suggested a multi-player deal, Walker and either Taylor or Miller for Upton and catcher Evan Gattis. While the M’s would only get one year of Upton, they would get four years of the oft-injured Gattis. Compared favorably with Red Sox Mike Napoli as potential right-handed DH/1b, such a trade could solve the M’s need for a power-hitting right outfielder and upgrade at DH. Could some of these things happen? Of course. Could none of these things happen? Hell, yes. It will be interesting to see what, if anything Zdurencik is able to pull out of his hat. It’s always difficult to know what to say about your team when the season’s over. The M’s didn’t make the playoffs, again. But you already knew that. The Giants beat the Royals in an outstanding World Series. You saw that too? Damn. Spring Training starts in February, with Cactus League games opening March 4th. Yeah, but you probably knew that too. Cliff Lee trade is officially a bust. In 2010 the Texas Rangers played themselves into a World Series with the help of a trade from the Mariners. Cliff Lee went to the Rangers for a bevy of highly regarded talent. Matt Lawson, remember him? Neither do I. More ink was spilled on Josh Lueke’s conviction for “wrongful imprisonment” and efforts to cover it up by Mariners brass than was actually written about the reliever’s pitching career. Blake Beaven left as a minor league free agent yesterday. A former first round pick, big guy who threw relatively slow, Beavan will seek his fortune in another organization. Just didn’t miss enough bats with his slow stuff Beavan never found success in the majors. Last year, the M’s tried to make him into a reliever. And of course, the cherry on top of the cake, Justin Smoak was claimed off waivers by the Toronto Blue Jays. I’ve always had hope the big South Carolinian would be a switch hitting monster, but it never happened. Of course, my big fear is the light will click on at age 28 and he’ll become a switch hitting monster for somebody else. So the book can now be closed on our deal for Cliff Lee. On the other hand, the Phillies did pay the big man Robinson Cano money for 81 innings of work in 2014. Kyle Seager wins Gold Glove. Yeah it’s the Gold Glove, and we’ve laughed at these in the past. It’s harder to laugh when it’s your guy who’s getting it. To be fair, at least Kyle was in the top three for defensive metrics with Josh Donaldson and Adrian Beltre, and the results weren’t conclusive. So congrats to Seager and M’s need to work on that contract extension. Felix Hernandez for Cy Young. Felix is nominated for and should win the 2014 AL Cy Young Award. He has a stronger record than he did the first time around. He also has thin leads in most of the sabrmetric stats that matter. Corey Kluber had a great year, but not quite as good as the King. So we launch into the opening of Hot Stove this week with the General Managers meeting. The M’s had a great year but need an even better offseason if they’re to have a shot at the playoffs in 2015. Apparently one of the first items on the agenda is to shop outfielder Michael Saunders, as October’s mysterious dispute between the team and Saunders’ agent continues. General Manager Jack Zdurencik will have to be smart with any deal for Saunders because, frankly, when healthy, he’s the team’s best outfielder and also pencils out to be one of the team’s best hitters. There aren’t any OF’s in the immediate pipeline. No mysteries what the team needs. A good DH is at the top of the list. Preferably a right-handed one with some swat-Victor Martinezish, Nelson Cruzy or a reasonably facsimile thereof. Outfielders may also be on the to do list even if Saunders stays, but definitely if he is gone. If the Mariners are to be truly competitive next year they will have to get more offensive. But we say that every year, don’t we. The pitching staff looks to be good. Felix and Iwakuma are gimmes. James Paxton is refreshing. Taijuan Walker is probably a lock to make the team. If his health is good Roenis Elias should make five. But what about injuries? Remember last spring training? Does Chris Young fit into their plans after his big 2014? The M’s will almost certainly look for depth somewhere. What about the bullpen? How much stays and how much of it is available to trade to fill the holes in the lineup? What’s the Plan A? What’s the Plan B? Jim Bowden and Jeff Sullivan have both written that heading into 2015 the Mariners could be the new kids on the block for the 2015 playoffs. At this point, all we can do is just go along for the ride and hope for the best.